The Milwaukee County Zoo will open its new elephant exhibit May 4, transforming a quarter of the zoo’s current layout and reaffirming its commitment to keep African elephants at the property. The exhibit includes a 20,000-square-foot "Elephant Care Center" with both sand and padded floors and five individual stalls for training and husbandry. The outdoor space includes hay-filled barrels that zookeepers are able to hang from the ceiling to allow the elephants to exercise their trunk muscles. Elephants in the wild would behave similarly, reaching high into the tree canopies, extending their trunks for branches and leaves to eat, according to zoo officials. The Milwaukee County Zoo made a commitment in 2013 to keep African elephants in its collection, said Zoo Director Chuck Wikenhauser. 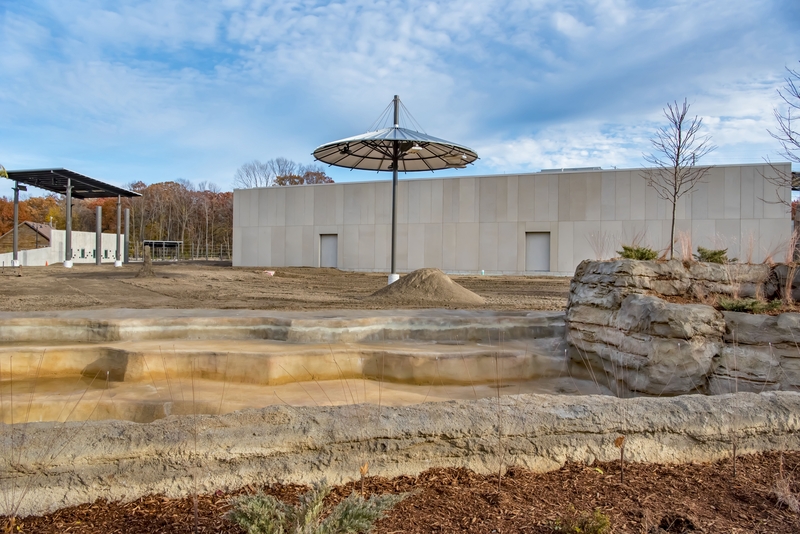 "This first phase of the Adventure Africa project showcases African elephants and the various state-of-the-art amenities and renovations necessary to give these animals the best possible care throughout their lives," Wikenhauser said in a written statement. The current elephant exhibit was one of the first exhibits built when the zoo relocated from Washington Park to Bluemound Road in 1958. The exhibit has come under fire in recent years for its size and lack of indoor space. In 2015, an online animal rights group called "The Dodo" cited The Milwaukee County Zoo as one of the 10 worst zoos for elephants. The zoo’s elephant exhibit was also named in a 2014 In Defense of Animals — another animal rights group — report. The Milwaukee Zoo’s new exhibit meets the Association of Zoo and Aquariums’ standards for elephant care and can accommodate up to five elephants, according to zoo officials. The zoo will keep current elephants, Ruth and Brittany, and is looking at options for additional elephants. The 1.6-acre outdoor space is four times greater in size than the current elephant exhibit. It features a watering hole able to accommodate three fully-submerged elephants, feeding and enrichment walls, shade structures and a self-activating shower. A demonstration pavilion with shaded visitor seating allows an up-close look at how keepers work with the elephants to offer the highest level of care through daily training and interactions. "It’s the zoo’s hope that visitors see the overriding goal was to make this entire habitat, both indoor and out, the most normal as possible for elephant behavior in a zoo setting, while also addressing the physical, social and psychological needs of the animals," Wikenhauser said in a statement. The $16.6 million project was paid for by the Zoological Society of Milwaukee and Milwaukee County. "The renovations were necessary, not only for the elephants, but for the staff’s ability to offer the highest level of care," Milwaukee County Executive Chris Abele said in a written statement. "The new exhibit also keeps pace with the quality of animal exhibits at other Midwest zoos." Later this year, the zoo will begin construction on a new hippo exhibit. Once complete, visitors will be able to view the hippos in a 60,000-gallon pool. The exhibit will be one of eight in North America with underwater viewing of the animal. The Zoological Society is currently raising $25 million for the project, which requires special technology to keep the water clear enough for people to see the animals.